So, my IBS (irritable bowel syndrome) has been making my day miserable since yesterday. Not sure if the culprit was the Indian food that we had for lunch yesterday or something else. I don't want to take meds for some reasons. I hope this will not make my life difficult for another more day (wahuhuhuhu...) Anyway, that's life. And while my gut is in chaos, I am wondering where to get some saba mackerel so I can make this delicious tinapa. 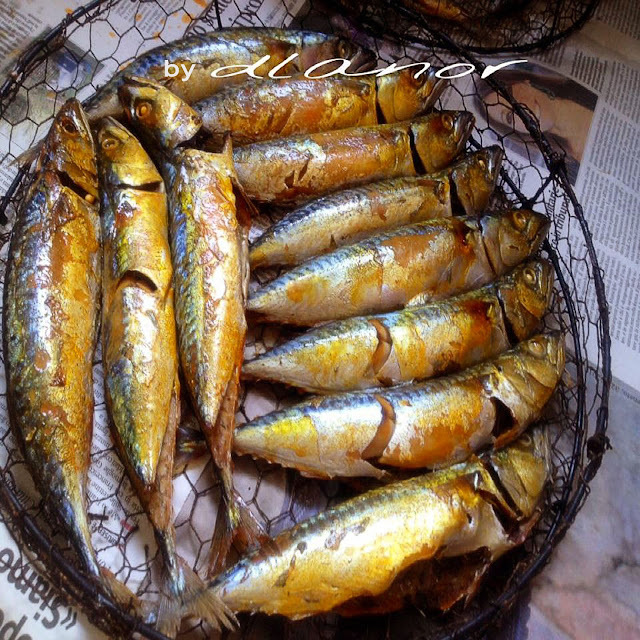 Tinapa is a famous fish delicacy among Filipinos. For Filipinos living outside the country, the mere mention of this delicious thingies will whet one's appetite. The truth is I am now drooling at the site of the tinapas in the picture wishing that we have these for breakfast. Oh yes, Filipinos like us, usually have this as part of our breakfast meal but you can have it any time of the day as you wish. My Mami will serve it with sauteed tomatoes and onions (check this for the recipe), scrambled eggs, and sinangag (Garlic fried rice). Don't confuse tinapa from tapa. The latter refers to cured red meats. Tinapa on the other hand pertains to the fishes that are preserved or cured through the smoking method. These delicious tinapa are sold all over the Philippines, either sold by vendors in wet markets, by street vendors, in sari-sari stores, even in large groceries and supermarkets. In Qatar, smoked bangus (milkfish) is available not only in Filipino and Asian stores but also in all large supermarkets. 1. Place water, salt, garlic, bay leaves, pepper, and knorr cubes in the bottom part of your steamer. Mix well. 2. Heat under low fire for about 5 minutes. Turn off fire and let the brine water cool down. 4. Remove the fish from the brine water to drain. Set aside the brine water for later use. 5. Arrange the fish on the steaming tray. Sprinkle with a little salt. 6. Over medium fire, bring the brine water to a boil. Turn to low fire and continue seamering. 8. Smoke fish until they turn golden brown.